This page created 25th July 2010. Crystals were successful in the very first round of London route tendering, in 1985, when they won the contract for the 146. For that contract they acquired a pair of ­Leyland Cubs, with angular HTI-Maxeta bodywork. They were route-dedicated to the extent of having 146 painted on the front roof-peak beside the tiny destination box! An ex-Ford demonstrator with 33-seat Wadham Stringer body was bought in 1987 as a spare for the 146. The contract was renewed in 1988, and Crystals bought two Optare StarRiders for use on the 146. Another Mercedes-Benz midibus from their coaching fleet was used as a nominated spare, also with 146 painted on the front. The 146 contract was not continued in 1993. L76DPE off 851 and L168EKR off 973 at Grove Park Bus Station on 2nd July 2001, beside TA159 (seen from passing MB17). But in 1994 Crystals tendered successfully to provide midibuses for London Mobility routes in south-east London. 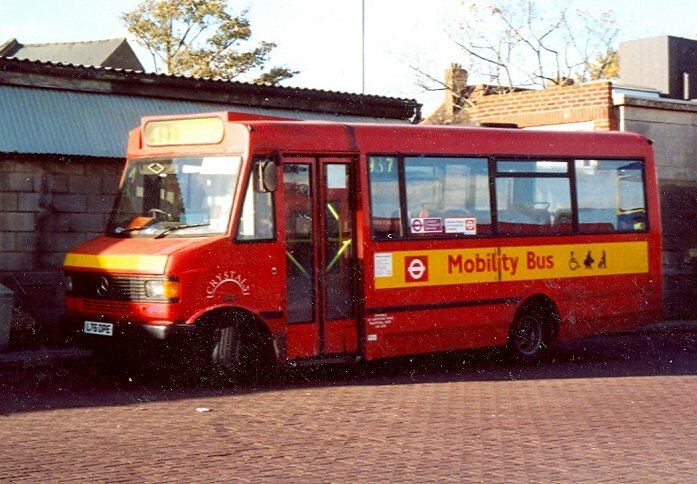 In the days before low-floor buses London offered a huge number of Mobility Routes to get people in wheelchairs to local - and not-so-local - shopping centres, most routes operating on certain days of the week, and serviced by buses fitted with wheelchair lifts. The buses chosen by Crystals were Mercedes-Benz 709D (later 711D), with bodywork by Crystals, most with a rear lift. More routes were gained at retender in 1997, when routes 931-937 and 970-973 were taken over from Stagecoach Selkent: the Mobility Bus Network in Lewisham, Bromley and Orpington. Two more 711Ds were added (P347/8HKU). In 2002 the Mobility Network was revised substantially, and Crystals no longer operated fifteen previous routes. But it added to its portfolio the 930, 938, 939, 940, 942, 943, 944, 949 and 950, covering areas as diverse as Thamesmead and Wimbledon Common. Later in the year the Croydon Networks were also altered, seven routes disappearing but the 912 added. August 2003 saw the TfL operations of Crystals swallowed up by Tellings-Golden Miller. Just two of the Mercedes-Benz Mobility buses were transferred to the T-GM operation: P347/8HKU. 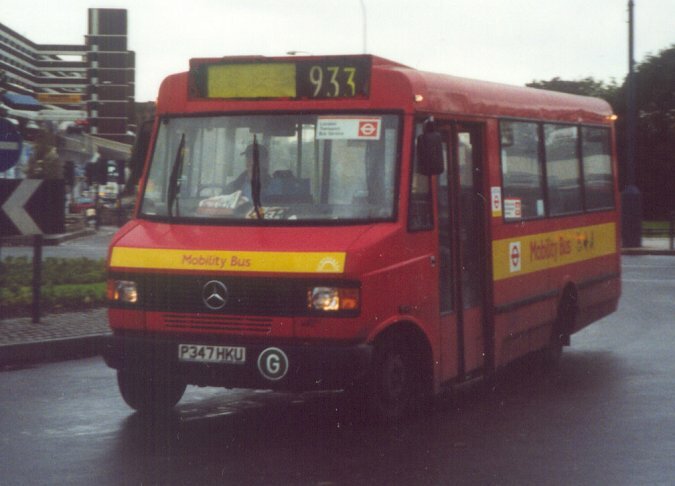 The former was still there when the same operations were taken over by Metrobus in March 2005, becoming 397 in the Metrobus fleet for five months , until sale. P347HKU comes in to Lewisham Bus Station off the 933 in October 2000. On a much nicer day L76DPE rests from the 937 at the Bromley North Bus Stance. Ian's Bus Stop Crystals main text. Crystals histories. Crystals photos.